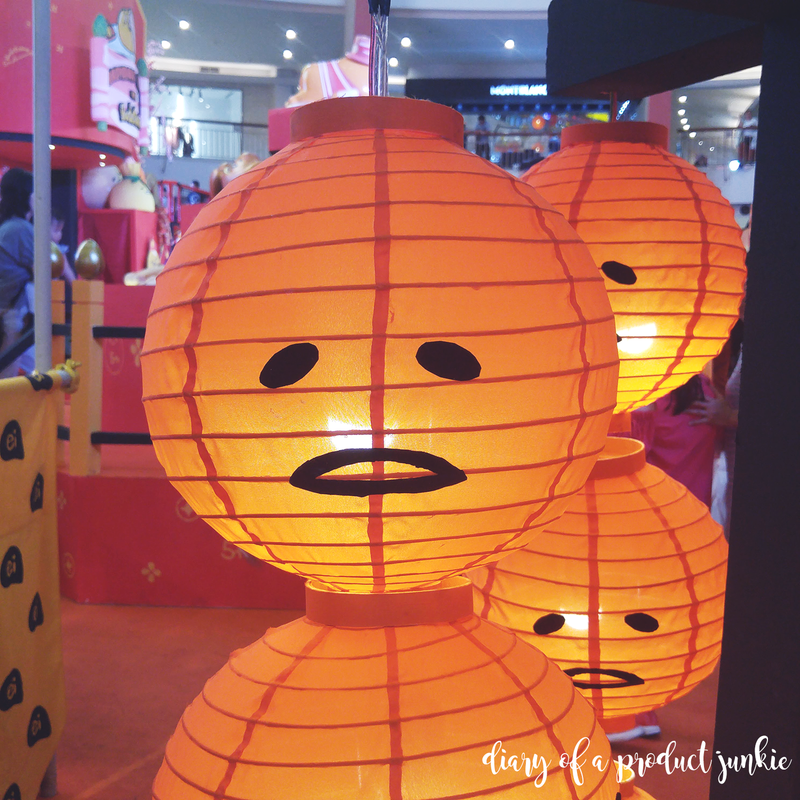 Last week, G and I went to an exhibition at Mal Kelapa Gading, where it features the glorious Gudetama in his natural habitat. We didn't specifically plan to go there, but somehow ended there, thanks to the twists and turns of the universe. 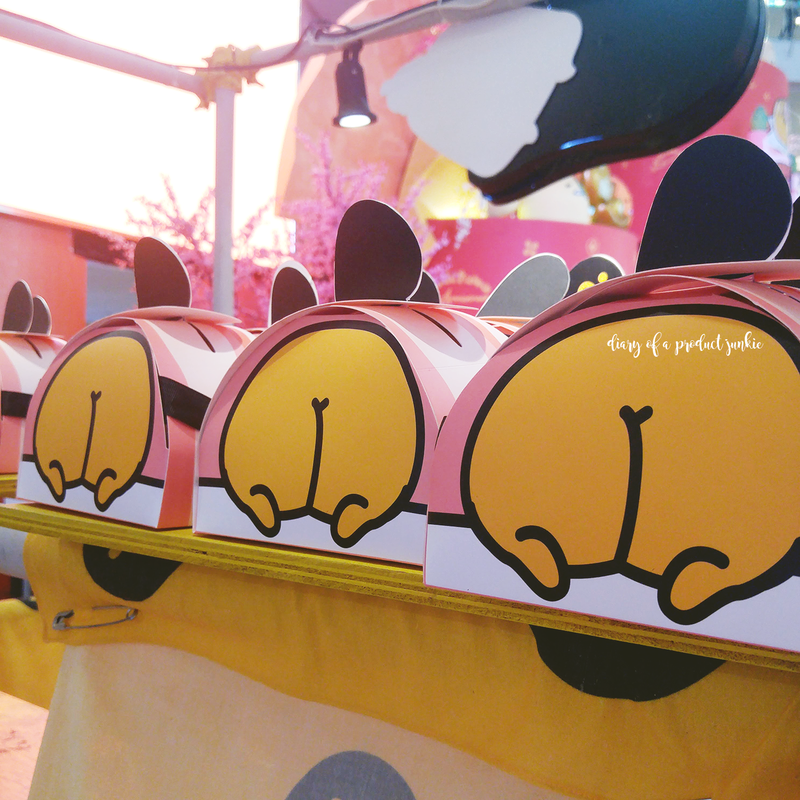 Not only is it an exhibition, but there was also a pop up store that sells Gudetama and Hello Kitty merchandises. 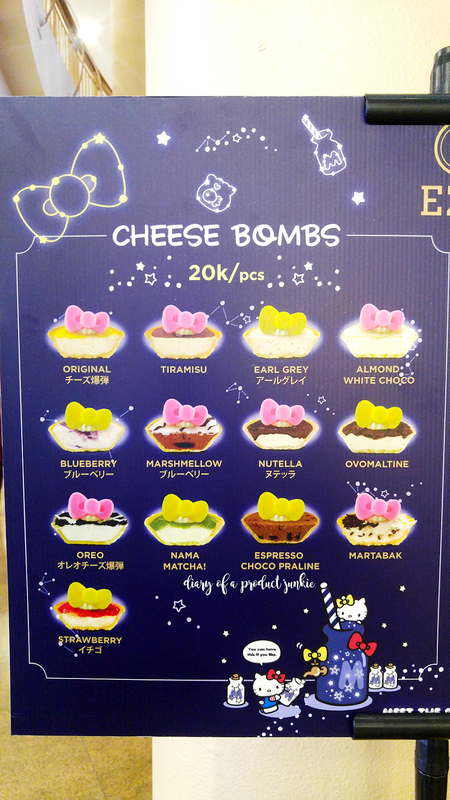 The concept of the store is lovely as visitors starts from the Hello Kitty entrace making their way to the Gudetama section with the merchandises being sold left and right. There are wooden plates, makeup items, stationery items to name a few. 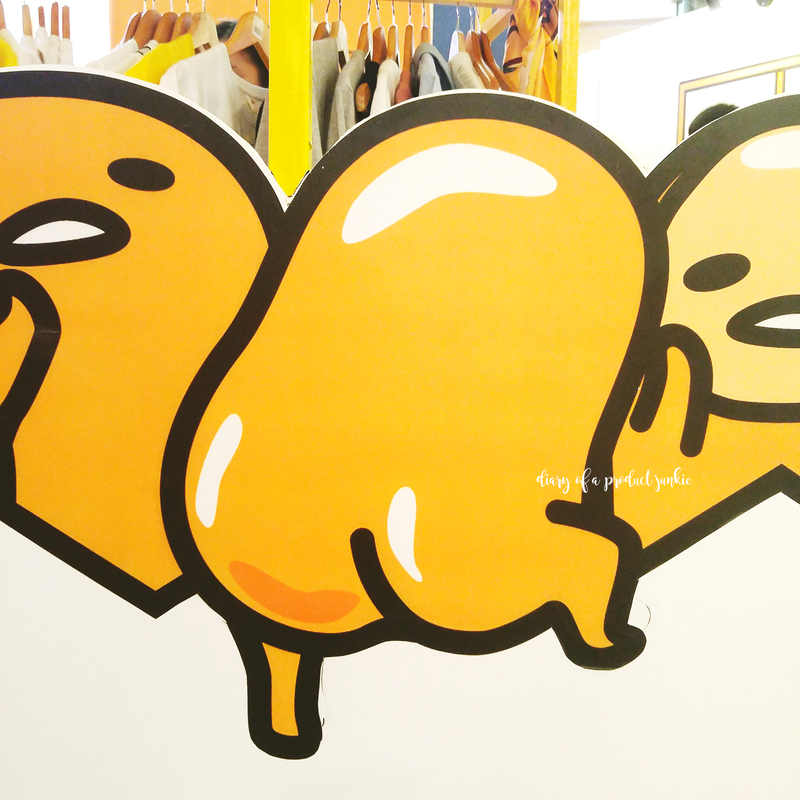 We went through the pop-up store once and I bought a liquid lipstick and a set of Gudetama stickers. Yeah, it's kinda hard to pass up the Gudetama x Goban Cosmetics collaboration, seeing as to how cute the Gudetama prints are on the liquid lipstick. The pop-up store are just half the fun because there is an exhibition in the middle where we played with the props! Anyway, this section has Gudetama in the middle with all the other Chinese-themed food with Gudetama's faces as props. These props are big! People are choosing which one they're gonna hold for their selfie/vlogging purposes, like we did. G and I had tons of fun looking at each prop and taking pictures of it. 2010 © Diary Of A Product Junkie All Rights Reserved. This blog is protected by CopyScape. Hi, there. I'm slowly beginning to try and blog again, so I thought why not start with a topic that I'm quite familiar with, which is skincare. I haven't really been trying a lot of skincare products, but there are few that I would like to share my thoughts with you. 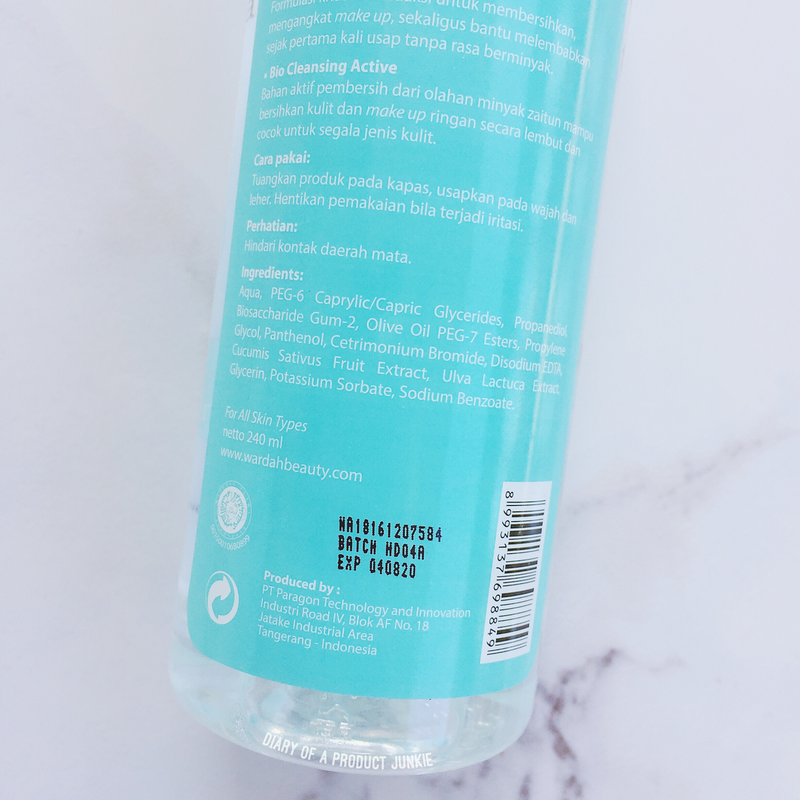 Skincare, especially cleansing and sun care, has been one of my favorite things to blog about. I love the idea of taking care of our skin that it looks and feels beautiful on its own. I'm not saying that I dislike makeup, but I'm just more comfortable with being makeup-free most of the time. 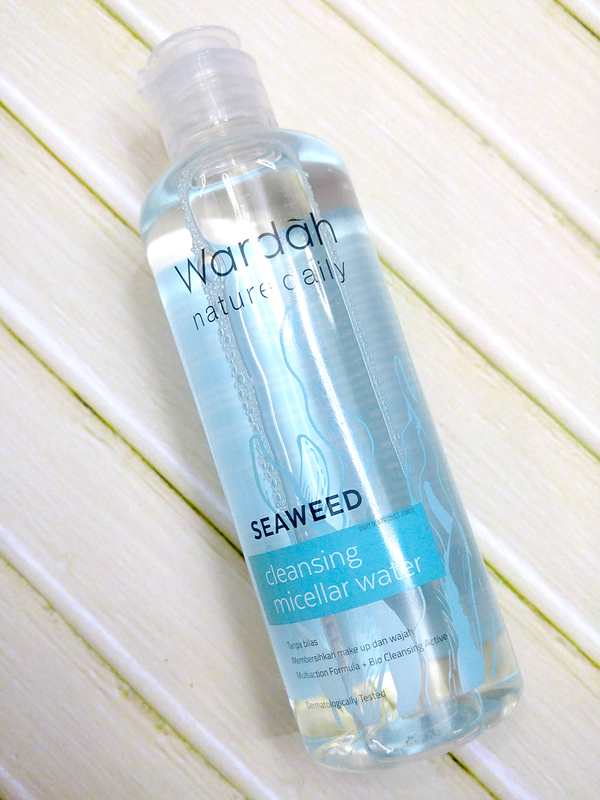 Before I start rambling, let me share what I think about Wardah's latest micellar cleansing water. With the cleansing water trend on the rise, I'm glad to see more local brands releasing their own cleansing water. 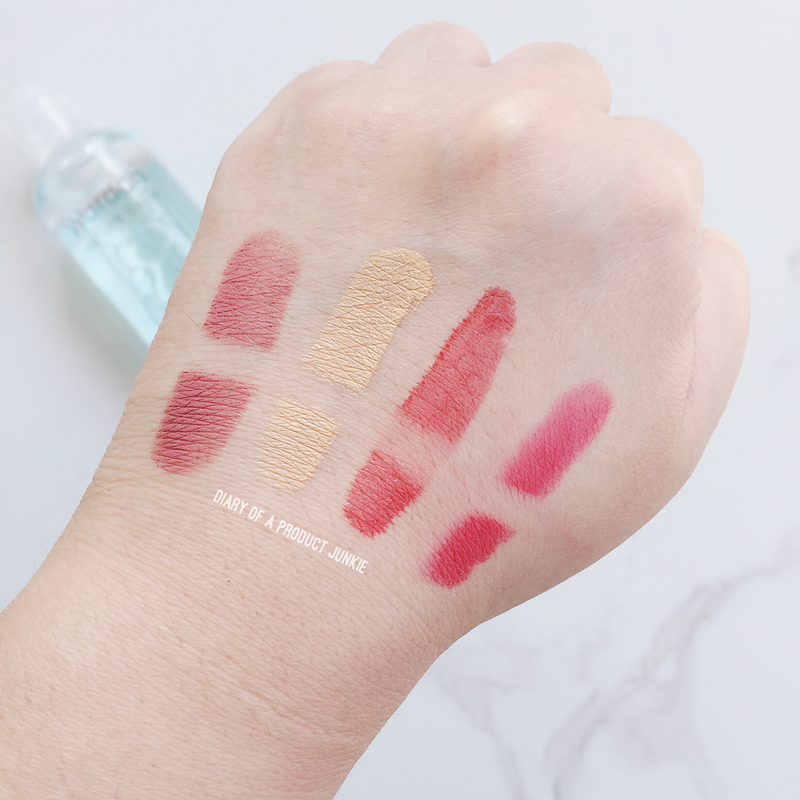 I have been a loyal Bioderma user since early 2014 and I have yet to 'convert' to other brands because of the fragrance component. 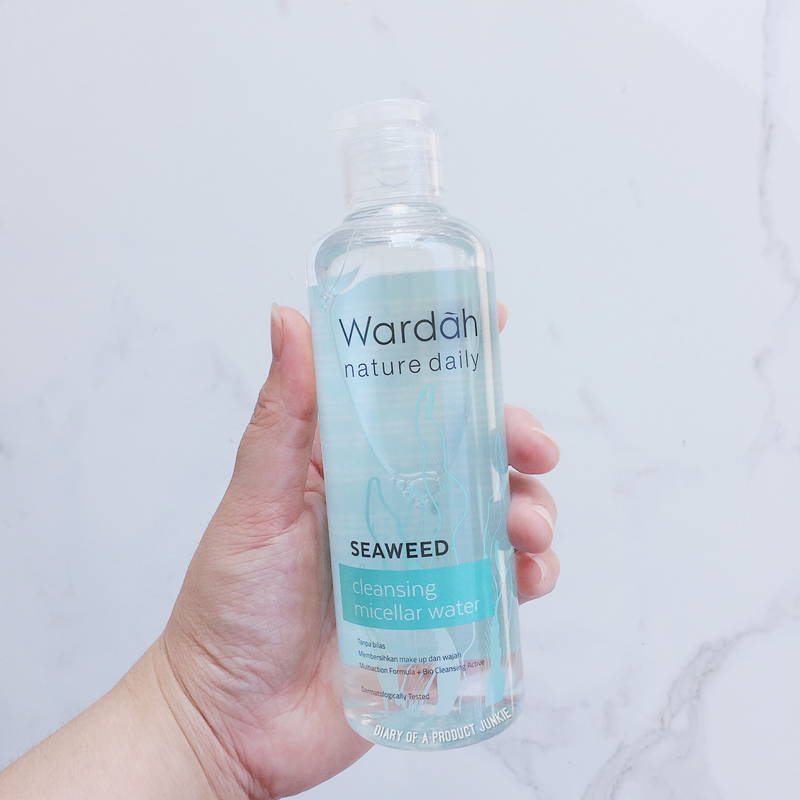 Wardah's cleansing water doesn't contain fragrance. It does NOT contain fragrance. Surprising, isn't it? Most local brands almost always has this ingredient without fail. Maybe consumers just love sniffing the products on their time off, but I digress. This 240 ml cleansing water is packed in a flip top bottle that is quite secure, but then again I haven't really tested it out travelling or *accidentally* dropping it on the floor the from third floor. Looks pretty safe though, just maybe don't go off dropping it from a tall building? Moving on to the ingredients list, I'm not gonna explain each one of them like I usually do. However, I'm just gonna point out a few things that is interesting as I go along reviewing it. I wouldn't say this is completely scent-free as I can still smell a slightly salty-fresh scent, maybe it's the seaweed combined with the cucumber extract that is making that scent? Not sure. It's not the greatest scent, but it didn't bother me too much. I guess my definition of troublesome scent is if it makes me nauseated and gives a throbbing headache. As with most cleansing water, you pour it onto a cotton pad and proceed to wipe your face thoroughly, without the need to rinse it off. I didn't feel any stinging sensation as it cleanses my face, even around my eye area. a hint of lipstick or lip tint. Micellar water usually is enough to strip all that off. The problem usually comes after cleansing; will this break me out and piss me off the rest of the week? I have been testing this for a month to see if said problem were to arise, but (luckily) it hasn't. My face is still the same oily-combination skin with a few sunspots here and there. I am GLAD to report that there has been no addition to the family, acne-wise. The only downside for me (or rather my oily combination skin) is the slight 'oiliness' on my T-zone area afterwards. This could be a saving grace for those with dry skin since it won't leave your skin dry after cleansing. Well, it does have lots of skin conditioning agents, so that pretty much explains it. Hello, lovelies~ I hope you're all doing great after a month has ended on 2018. Also, I feel like I should give you fellow readers another name that is unique to this blog. Lovelies is a common name, so let me know if you have ideas on what I should call you. On with the post, then! The first month of 2018 has already ended and it feels quite fast for me, to be honest. Maybe because I often go into pilot mode and daily routines that it doesn't really feel that long, despite the time being constant. Anyway, I wanna share with you some of the things that I've really liked last month, ranging from skincare, makeup, TV series, anime series, and so on. 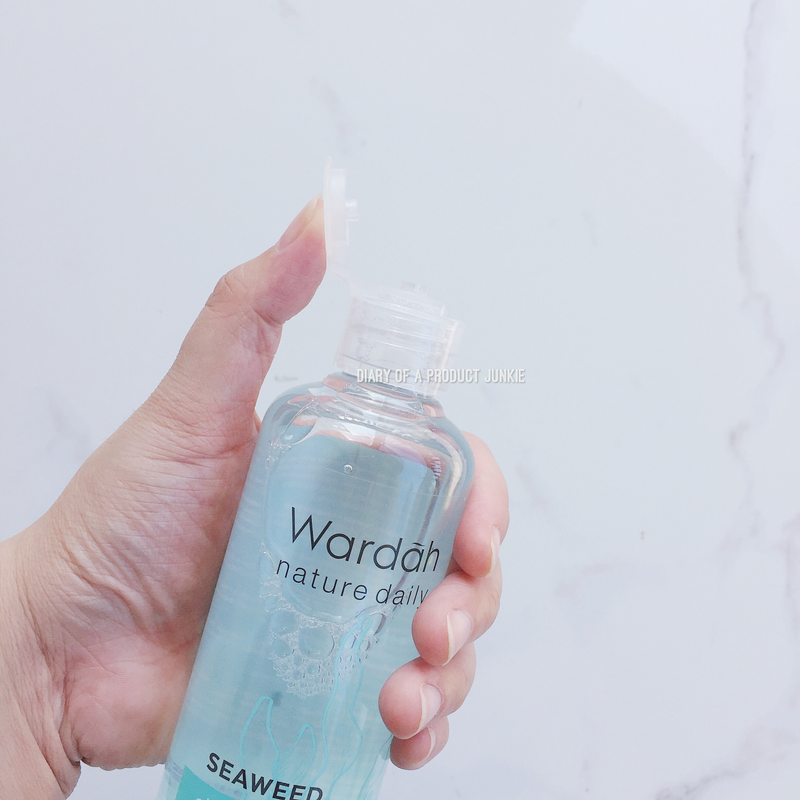 Since this was originally a beauty blog, let's start with a local skincare product that my skin has been liking lately and that is Wardah Seaweed Celansing Micellar Water. In general, Wardah skincare products has been a good match for my skin. 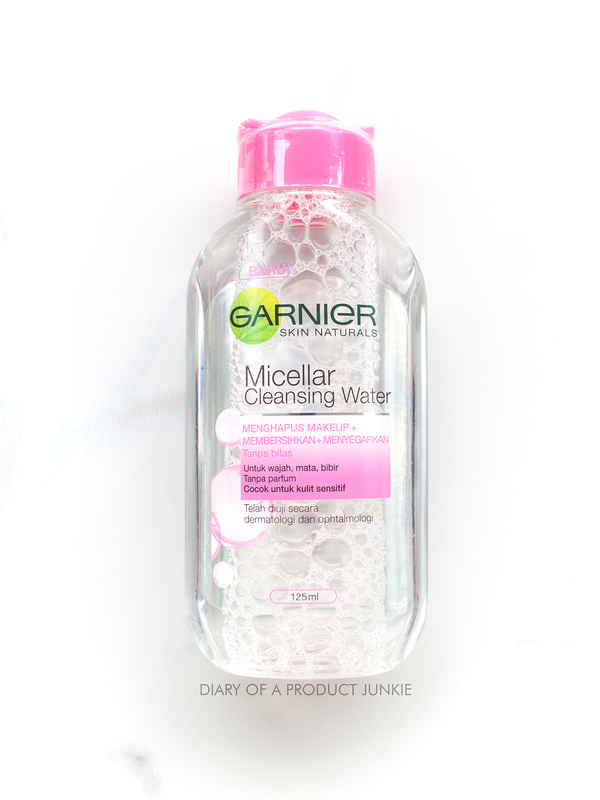 It works like any other micellar water and you don't haev to rinse it off with water. 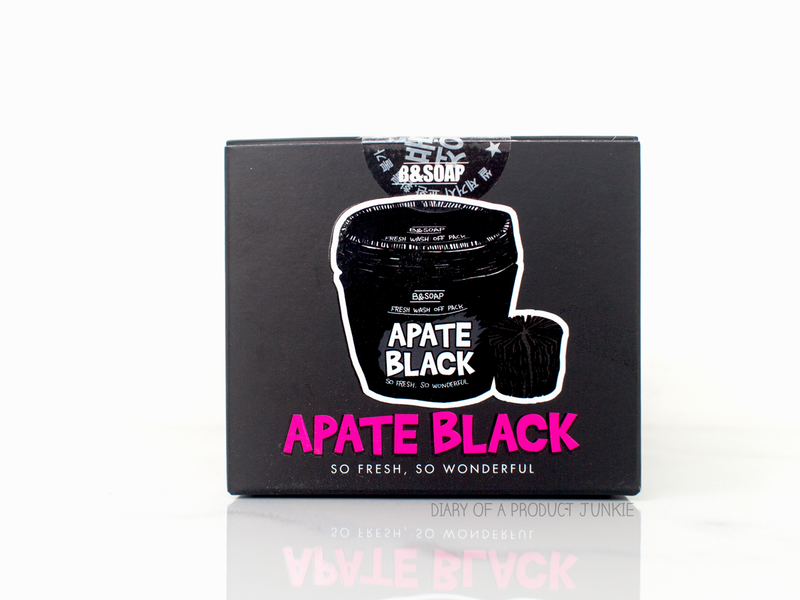 It doesn't contain any colorants, paraben and fragrance, which is unusual for a local skincare product. I don't feel any stickiness afterwards and it doesn't break me out. Being that I'm 30-ish and my sleeping habits isn't exactly the greatest, my under eye area has been dry and dark like my soul. I found this gem from L'oreal called the White Perfect Magic White Eye Cream that promises to lighten my dark circles. Well, it completely does make it slightly brighter, but there is alcohol in it, so I won't be using it too often for fear of aging, lol. However, I like using it as an under eye primer before I apply my concealer since it does have a silky finish thank to dimethicone. 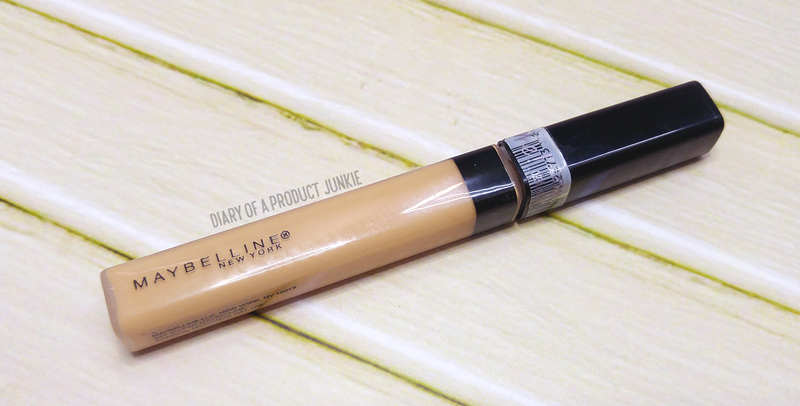 Moving on to concealers, I am falling in love with an oldie but a goodie, the Maybelline Fit Me Concealer in shade 20 Sand. 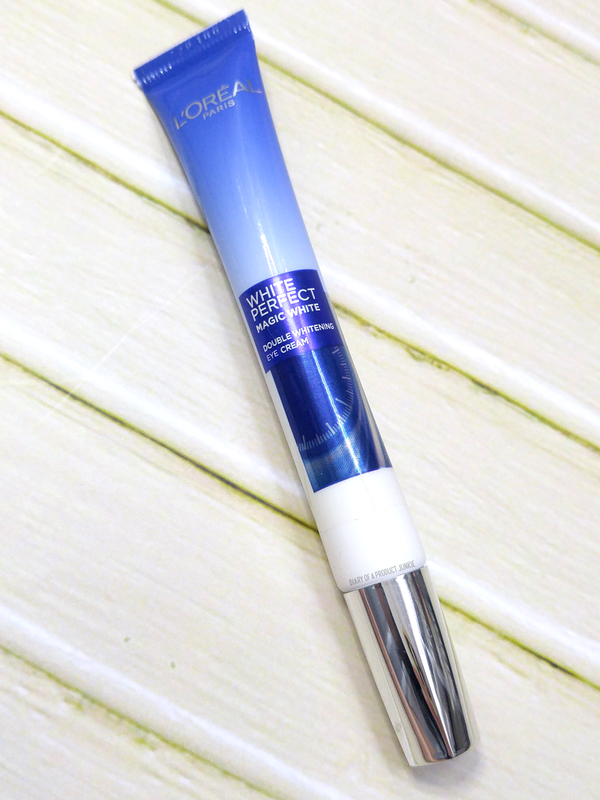 With a consistency that is more on the thinner side, this concealer blends effortlessly even with just my fingers. I like applying it under the eyes because it doesn't end up being dry and flaky like my other concealers. I don't have a lot of beauty favorites this month, imagine that. I do have this Selfie Ring Light that I often use to light up my Instagram videos that are horrible without the lighting. It charges via USB cable and gives off just enough light that the video is brighter, but not too harsh of a lighting. G and I have been watching a lot of TV series lately and this month we have been binging on Peaky Blinders. It's played by Cillian Murphy and his role is the head of a gangster family in Birmingham called the Peaky Blinders. The series offer drama and various accents that I love to hear. Do you know how hard it is for me right now to just type this sentence? Ack, I even forgot to greet you, lovelies. I've been having battles with myself.. Battles that I won in the end. I have been thinking over and over again whether I wanna just delete this blog and start anew or just pick up where I left off. I even talked about this with G for a few months back and forth. I finally came to a conclusion that I will keep this blog and write whenever I can. A sanctuary for my thoughts.. Despite all that, I just wanna say thank you for everyone that has been reading my blog for the past few years, when it was still up and going. Hello, lovelies~ I'm trying to get into the routine of blogging again, but it feels harder than a few years back. The mood just isn't there anymore, sometimes. However, it does come once in a while, the blogging mood. So, still gonna be keeping this blog for a while longer, I guess. Anyway, let's just start with the review, shall we? Hello, lovelies~ Wow. 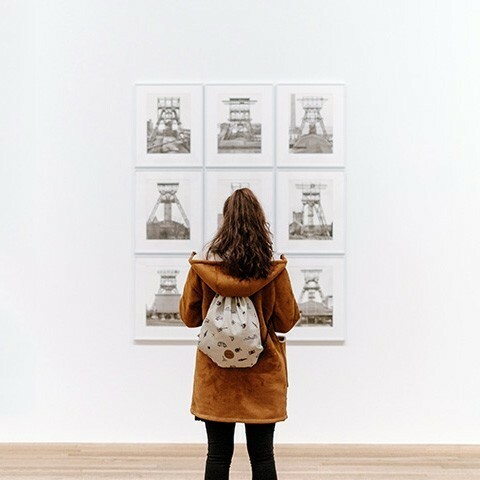 I haven't blogged in a while, have I? Let's just say that I haven't had the mood to sit still and type away all of my thoughts. However, it's back now, so I'm gonna start blogging again. Possibly starting with skincare products because there is a lot of them lining up to be reviewed. Just to refresh your memory, my skin type is combination skin, with an very oily T-zone and normal, but sometimes dry U zone. I'll start with a wash off mask pack from B&SOAP, which have an almost similar packaging theme to LUSH.